TORONTO, April 11, 2019 /CNW/ - Not all heroes wear capes. Real-life four-legged heroes walk—and bark—among us. Experience the life-saving superpowers and extraordinary bravery of some of the world's most remarkable dogs when Superpower Dogs, a new documentary film from IMAX® Entertainment, Cosmic Picture and presenting sponsor Mars Petcare, opens at the Ontario Science Centre on April 12. Narrated by actor Chris Evans (Captain America: The First Avenger, Gifted), the film spotlights six exceptional dogs with jobs across the globe—from Canada to Kenya. 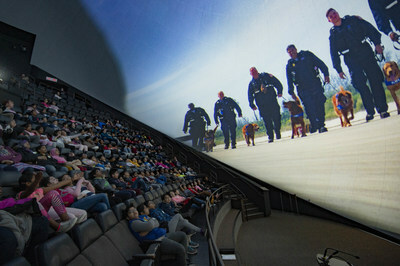 "For the last 10,000 years, humans and dogs have co-evolved to a point where today they are our friends and companions and—as this inspiring film shows—our heroes," said Maurice Bitran, PhD, CEO and Chief Science Officer, Ontario Science Centre. "We hope Superpower Dogs encourages visitors to learn more about their pets and sparks their curiosity in fields like animal psychology, biology or veterinary science." "We wondered what it would be like to show the world from a dog's perspective—through their eyes, ears and 'noses'—and used a specially-designed, doggie-vision camera rig when filming to provide this viewpoint," said Taran Davies, Producer, Cosmic Picture. 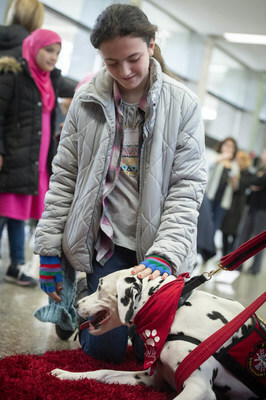 "In an up-close-and-personal way, the film celebrates dogs and their interspecies relationship with humans. As our understanding of dogs broadens, we wanted to show how pets improve not only individual lives, but communities as a whole." 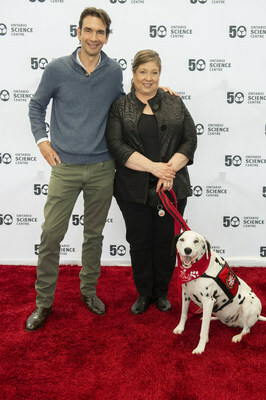 Superpower Dogs was filmed over two and a half years, beginning in January 2016, with the help of more than 500 people, including biologists, cognition specialists, geneticists and researchers, working in Canada, Italy, Kenya, the Netherlands and the United States. Superpower Dogs is rated G and has a run time of 45 minutes. Tickets are $9. To watch the trailer and to purchase tickets, please visit OntarioScienceCentre.ca. For downloadable photos and general press information, please visit the Ontario Science Centre's online Media Room. Guided by our mission to inspire passion for the human adventure of discovery, the Ontario Science Centre strives to be a global leader in lifelong learning; a vital link in Ontario's education and innovation ecosystems; and a convener of public dialogue about technology, science and society. The Centre has welcomed more than 53 million visitors since opening as a Centennial project in 1969, pioneering an interactive approach now adopted by science centres around the world. An agency of the Government of Ontario, the Centre relies on funding from the province, as well as donations from generous individuals, corporations and foundations who share the Centre's vision to contribute to a more curious, creative and resilient world. Learn more at OntarioScienceCentre.ca.